Thefirst close-up photos of the battered asteroid Lutetia taken by a Europeanspacecraft have amazed scientists with views of a possibleotherworldly landslide and a deep depression gouged across the landscape thathints at the space rock's ancient, violent past. The new photos of Lutetia, beamed back from the European Space Agency's (ESA)Rosetta space probe during a Saturday flyby, show what scientists said is a primitive asteroidsurvivor from the tumultuous birth of the solar system. "Ithink this is a very old object," said Holger Sierks, principalinvestigator for Rosetta's main scientific imaging system, OSIRIS, in astatement on the night of the flyby. "Tonight we have seen a remnant of thesolar system's creation." Closeviews of Lutetia show that the space rock is covered in craters from manyimpacts during its 4.5 billion years of existence. AsRosetta drew close, a giant bowl-shaped depression stretching across much ofthe body of Lutetia rotated into view. What appeared to be an asteroidlandslide was also spotted in the spacecraft's photos. Rosetta'sflyby confirmed that Lutetia is an elongated body, with its longest sidespanning approximately 81 miles (130 km), ESA officials said. TheRosetta spacecraft is actually headed to visit the comet67P/Churyumov-Gerasimenko in 2014. The Lutetia flyby ? as well as an earliervisit to the asteroid Steins in 2008 ? was a pit stop on the way to the probe'sultimate comet destination. "Ithas been a great day for exploration, a great day for European science,"said David Southwood, ESA Director of Science and Robotic Exploration, in astatement. "The clockwork precision is a great tribute to the scientistsand engineers in our Member States in our industry and, not least, in ESAitself. Roll on 2014 and our comet rendezvous." TheasteroidLutetia remained a mystery for many years until Rosetta's Saturday flyby, largelybecause previous observations from ground-based telescopes found some confusingasteroid characteristics. Somemeasurements placed the asteroid in the 'C-type' category left over from theformation of the solar system, which means it contains primitive compounds ofcarbon. Yet other studies suggested Lutetia was an 'M-type', which would meanthat there are metals on its surface. These have been associated with ironmeteorites, are usually reddish and thought to be fragments of the cores ofmuch larger objects. Thenew pictures of Lutetia came from Rosetta's OSIRIS instrument, which combines awide angle and a narrow angle camera. At closest approach, details down to ascale of almost 200 feet (60 m) can be seen over the entire surface of the asteroid. Thenew images, combined with compositional data, will help astronomers determine howLutetia stacks up with other solarsystem asteroids, researchers said. Rosettaturned its full suite of instruments on Lutetia during the weekend encounter,including remote sensing and in-situ measurements. Missionmanagers even switched on some of the instruments on Rosetta's Philae lander,which will land on the probe's target comet, to take more observations. Together,Rosetta and its lander scoured for evidence of any highly tenuous atmosphere ormagnetic effects on Lutetia, and recorded the space rock's surface composition anddensity. Rosettaand its Philae lander also attempted to catch any dust grains that may havebeen floating in space near the asteroid for additional on-board analysis, ESAofficials said. The data and results from these instruments are expected tocome at a later time. Rosettazoomed past the asteroid Lutetia on July 10, at a relative speed of 32,400 mph (52,142kph). The closest approach took place at about 1610 GMT (12:10 p.m. EDT), at adistance of about 1,900 miles (3,162 km).? Still,the cameras and other instruments onboard Rosetta had been working for hours,and in some cases days, beforehand. 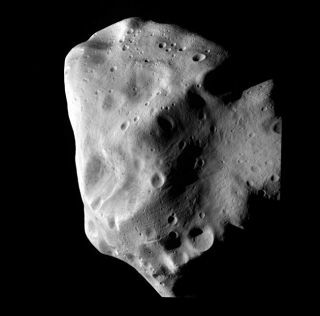 ESA released preliminary images as thespacecraft neared Lutetia, showing the asteroid growing larger on approach. Rosettawill now continue on its path to the spacecraft's primary target, a rendezvouswith the comet 67P/Churyumov-Gerasimenko in 2014. It will then accompany thecomet for months, from near the orbit of Jupiter down to its closest approachto the sun. InNovember 2014, Rosetta is expected to release the Philae lander to touch down onthe comet's nucleus.